Anyone interested in good 500-1000 LED lights? Please, not that this won't cheap lights as we are aimed at high quality stuff. VK...you read my mind. I was just over at cool lights reading their articles on LED. Basically said that CRI>80 was not possible....then again, the blog was from '09. That said, the reason I'm researching LED panels is that I'm interested. Especially the 1000 LED panels. Looking at purchasing a couple of good quality panels and these look great. I'll add photos of other models later. One of them, as seller claims, had been produced for Flolight (with same CRI). You can see it at the link above. I really doubt CRI for single colour LED lights. Btw, anyone is interested in LED based Fresnel lights? I would seriously be interested in one of these. what is a ballpark price for one? LED Fresnel would make a nice universal portable light. Panels are not good for portraits where a narrower beam is necessary. Well, it's affordable, but not cheap. Yep, not a frequent thing. In reality Chinese are working on them and only first prototypes are ready. Most probably our members will be first owners. I'll give the fresnels a try as well. This legal action against Chinese LED import is interesting. I wonder if it will effect the price of existing stock of LED panels. I'll ask them after holidays. Fancier do not produce any LEDs, they just rebrand them. In contrast we try to work with manufacturers or companies close to them (if manufacturers work with big dealers only). So for about $65, eight fluorescent floods will produce as much light as one $425 LED panel. Thanks for the (re) focus & the link. back on the right track, now! I already referenced coollight article. To be short, you are comparing things that must not be compared (never compare lumens), first. Second, I am sure you tried work with this sets with bunch of CFL bulbs? Me too, and while they can give beautiful light, they are not very handy outside of studio work. Carrying the bulbs, setting everything up gets annoying ect. That's where LED's are much more practical. >Carrying the bulbs, setting everything up gets annoying ect. This is what I am talking about. Bulbs are very easy to break, btw. @Vitaliy_Kiselev - "Bulbs are very easy to break, btw. " For storage and transport, I keep the lamps stored in their protective retail boxes, eight of which happen to fit perfectly inside a lightweight plastic container with a latched lid that I found at a hardware store. In the photo, I assembled four of the lamps into one of the 4-way fixtures I use them with. The lamp sockets in these cheap Chinese fixtures are really flimsy and I permanently installed socket extenders to avoid putting any wear on them. To accommodate the width of the circular floodlamps, I use long extenders in diagonally opposite sockets to offset the height of adjacent lamps. The virtue of this lighting rig is that the individual components are cheap, lightweight, and easily replaced. Light stands are so prone to on-set accidents that aside from secure, ceiling-mounted units, I'm reluctant to invest in expensive high-quality equipment. But I think that it'll be better to make something like Cheap fluos vs LED lights topic. Small image of LED fresnel. I had small talks today and it looks like samples will be available in limited quantity for < $1000. 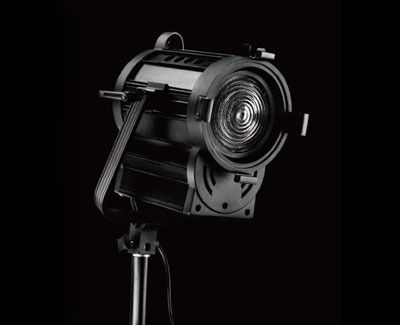 Lux is stated as 650w fresnel analog. Hmmm.... 5600K no problem? Good spot lighting? No more green tint? No color change at dimming and brightening? If yes yes yes yes, WOW. But $1000 is definitely out of price range. Must be lower than $1000, I'll let you know soon. Any news on a good deal for the 1000 LED lights? Most probably, will be on since Monday.